stockholm camper: Architecture in Stockholm! View Stockholm from the water as it mirrors the surrounding harbours and sparkles. Stockholm's extensive historic buildings and more contemporary buildings give Stockholm the well deserved reputation of one of the most Architectural and design cities in the world. Cruise into Stockholm with your motorhome all geared up for days taking in all the art and design of this beautiful city. The Modern Museum could be your first stop. Opened first in 1958, the museum grew in popularity as a result legendary exhibitions and aquiring of collections. The Museum hosted an architectural contest for it's new building which was won by Rafael Moneo. The newest museum is well worth a visit for art buffs but if you get tired of staring into the depths of each piece, overlook Stockholm's bay in the fantastic restaurant. Stockholm Culture House is designed by the Architect Peter Celsing in 1974 and has since been a hub for art and culture. Inside the perfectly designed walls you will find three galleries, public exhibitions, theatre spaces a library and numerous restaurants. In the depths of the house you will find the 'Design Square' where there are numerous design items for sale created by emerging Swedish designers. For a designer meal, Fredsgatan 12 is a very contemporary and stylish restaurant. The menu is creative and intriguing with eclectic combinations and must try morsels. The city hall, with it's towering observation point is a landmark of the town and with it's pinnacles decorated with three dazzling golden crowns. It is open to the public which is a relief as the 'Blue Hall' is a must-see. The interior of the Golden Salon is decorated with 19million plated mosaic tiles and it's flamboyant beauty is breathtaking. The Architectural Museum was opened to combine a modern museum and a photography museum. It displays all things architecture so is perfect for the art aficionado. Fortunately if you're in a campervan there will be plenty of room and you'll be able to make a purchase in Asplund Interior design shop. The beautiful shop offers designs from Swedish and international artists. 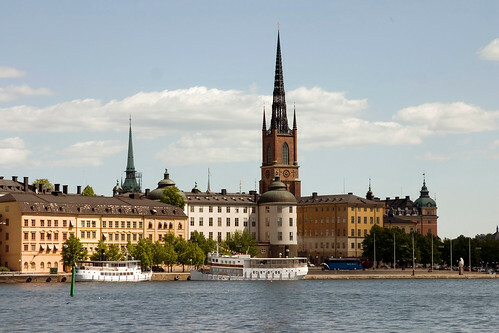 We recommend purchasing the Stockholm card which provides free entrance into 75 sightseeing spots! It is sold in most tourist information centres. Explore the architectural beauty of Stockholm, but don't spend money on hotels that'll cost you the earth. Feel the freedom and flexibility of a Campervan. Book one through Motorhome Scandinavia and let the architectural tour begin.